Sailing offshore has always left us out of the information loop when it comes to weather forecasts. This has not been all bad. We have developed the skills to deal with weather of all kinds, however it would be nice to try and duck out of the way of major weather systems when possible. We don't have, and can't foresee having, a SSB transceiver. 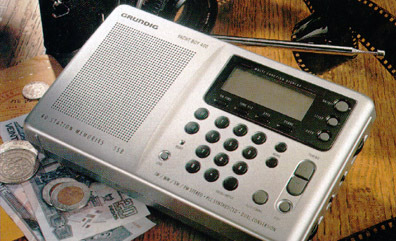 We do have an older Grundig Yachboy that we have used for voice weather forecasts from NOAA with good success. We have now added the software, actually two pieces of software, to the Acer laptop that will allow us to receive weather faxes where ever we might be. The only hardware purchase we needed was a mono 3.5 mm sound cable to attach the radio ear phone jack to the microphone jack on the computer. The software we are testing are JVComm 32 and SeaTTY v2.37. Our preliminary testing is showing that both are very good but we are leaning towards the SeaTTY due to its less expensive registration. We will need to work up a better antennae and will be assembling a wire in a rope antennae to run up a burgee halyard. It would be nice to have the antennae inside the mast but this is only possible with wooden masts, not our aluminum masts. We saw a rig such as we have now a number of years ago while circumnavigating Cuba. It worked very well using a lead from an old extension cord as an antennae. Another slide down the slippery slope of technology now that we have electricity. What will the next item be? I have some ideas! This is a great idea. We have an ssb on Phantasia and receiving weather forecasts is not easy. Would this software work with our ssb ? Hi Mike - If you can connect your laptop to your SSB with the appropriate audio cable the software should interpret the audio signal into a weather fax image. For the cost of a cable and taking the software for a demo ride the experiment should be inexpensive. I'd be interested in hearing how your application works. I'll give it a try when we get back to Bay of Islands next season Bob.